We all have special events in our lives, and it's such a wonderful pleasure to have photographs of those memories to cherish. Don't join the ranks of those who trusted a well-meaning family member or friend to photograph their once-in-a-lifetime event and ended up disappointed. You need a professional. 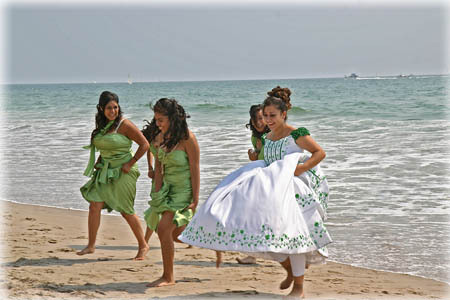 I can provide professional images of your wedding, quinceañera, baptism or other special occasion at a reasonable price. I am centrally located in the Corona Norco area and provide my skilled services primarily in the San Bernardino, Riverside and Orange County areas. In this site you will find my portfolio, planning guides, answers to frequently asked questions and rates. Please take a look and contact me if you have any questions. I would love to hear from you, whether you have used my services before or if you would like additional information. Thank you and I hope you enjoy my photo gallery. Orange County cities include Aliso Viejo, Anaheim, Brea, Buena Park, Costa Mesa, Cypress, Dana Point, Fountain Valley, Fullerton, Garden Grove, Huntington Beach, Irvine, Laguna Beach, Laguna Hills, Laguna Niguel, Laguna Woods, La Habra, Lake Forest, La Palma, Los Alamitos, Mission Viejo, Newport Beach, Orange, Placentia, Rancho Santa Margarita, San Clemente, San Juan Capistrano, Santa Ana, Seal Beach, Stanton, Tustin, Villa Park, Westminster, Yorba Linda. Riverside County cities include Corona, Lake Elsinore, Moreno Valley, Murrieta, Norco, Riverside, Temecula, Wildomar. San Bernardino County cities include Chino, Chino Hills, Colton, Fontana, Grand Terrace, Loma Linda, Montclair, Ontario, Rancho Cucamonga, Redlands, Upland. Also Claremont, Covina, Diamond Bar, Pomona, West Covina.